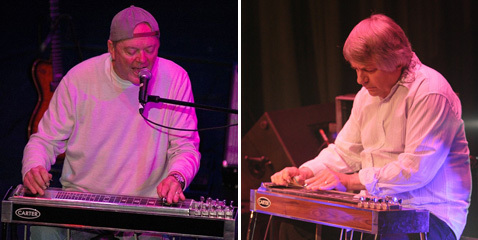 Steel guitarist Rusty Young is the band leader of Poco, an iconic country rock group that was formed in 1968. His stage presence, dynamic personality and obvious chops inspired many budding steel players of his generation. All of Poco's other original members have moved on, but Rusty Young continues to excite audiences to this day. Steel guitarist John David Call was more understated in Pure Prairie League, another country rock band from that era. Similarly, his playing inspired many players, but he dropped from sight when he left the band in 1977. In June of last year, PPL fans were delighted to learn that John David Call has rejoined the band. Pure Prairie League maintains a sparse touring schedule of 2 or 3 gigs per month. Lastly, just for kicks, I leave you with a link to a YouTube video (not steel guitar) of Rusty Young perfoming his new song, "Neil Young Is Not My Brother". Click here. He could have fooled me! John David Call continues to perform with PPL heading into 2016 and still sounds incredible. The band plays year round and does about 40-50 shows, still selling out many venues across the country. Call is doing things no one does and is still lightning quick in his trademark duels with Donnie Clark's outstanding lead guitar.That approach started on their 1972 debut release and was far more dynamic than others of the genre. Call is the only pedal steel player to take the center circle at The Grand Ole Opry where he's received standing ovations. Call's style was never more "understated" as mentioned above! If you are familiar with his concerts and LP's you would realize he was the exact opposite: he brought the pedal steel to the forefront, not a background instrument or fill in. His steel was up front and center , for my money more aggressive than the other country rock steelers. He could take a song from start to finish, blending in his steel with guitars , piano's etc far more effectively them others, then boom , an outrageous lead . Great stuff from the best ! If anyone could be described as dynamic or influential , it's Call whose steel was a major reason PPL was on top of the country rock scene , taking it into the national mainstream. Catch him in concert and you'll agree.